As I window shop through the great Internet I found a great company called Childish. Childish is such a great name for a company geared directly towards children. Childish has so many great fashions. Let me share a few of the ones that I loved. The simple style that the company childish used to create the design of this great dress reminds you of the free style of days gone past. Just what a child needs to wear to have a great time in. Childish clothing company products include those adorable short little dresses and great icons such as a pink unicorn seems to allow the dress to make every day fun. I also love the tees for boys that are available at childish. Childish serves both boys and girls and for both sexes childish clothing styles are great. With this tee Childish Clothing company allows a young man to wear the pride of his dad on his chest. What else would make a dad prouder than his little man proudly stating that his dad was his hero? Childish was generous enough to send my granddaughter some great items sh received a great dress that had a unicorn and a statement punk princess. Is that not cool! I love it and so did her momma. Childish also sent us a great blanket that had the pattern of skulls on pink. Now what is punker than that? Cool let me tell you. The idea was to present the blanket and the dress to my granddaughter but that did not quite work out. This special blanket drew my daughters attention to it. So perhaps my granddaughter will receive the dress as planned but the blanket as cut as it is will go to my daughter as she heads off to college. After all she is still my baby LOL. Just goes to show you that the Childish company enough is cool enough to impress those that are young and those that think they rule the world. So if you are looking for a great gift for a baby or toddler, boy or girl or a great gift check out Childish clothing. The Childish Clothing company has the coolest items available on the Internet in my opinion. Not only do they sell items for that young boy and girl but also for the momma to be. Childish clothing styles for maternity, the little princess or little prince will leave them looking cool and trendy. Both gifts that we received from the Childish Clothing company were great. The preppy rock star junior in your family would be very happy and impressed if you brought them home a present from the Childish Clothing Company. Perhaps the reason that the clothing line of Childish is because the creator is the great Skye Hoppus, a former MTV executive married to Mark Hoppus of blink 182 and +44 and mom to 5-year-old jack. Who else would you trust your rock star personality of a super star to? Childish clothing company is a rather young company being created just a few years ago in 2003. But where Childish lacks in years of experience they make up in great styles, that allows you and your little ones to look classy. Just think what your children's friends will being saying about their new rock star appearance when they appear in their new Childish threads. The Childish Clothing company wish is to set a trend setting pace that creates a great appearance for those who wear them. You can find Childish Clothing internationally at fine boutiques and select department stores. 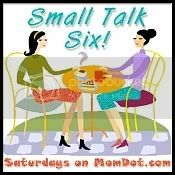 for more small talk 6 answers check out here. There are days that you can tell that spring is truely in the air. Those of us who love to garden have it in our bones to start planting. We can help those that are younger by allowing a fun time while planting and the tickle me plant can do just that. I know that when we received our tickle me plant my son had lots of fun planting the seed and waiting to see what would happen. The mission statement of the Tickle Me Plant is that they want every child (and those young at heart) to have a positive experience growing plants. I can remember raising plants with my father and now you have the same opportunity to raise the tickle me plant with a youngster that you love. Larry wants to give one of Annie's home readers an opportunity to win a tickle me plant. Buy: Tickle me plant can be bought from here. Win: One winner has the chance to win a tickle me plant. all entries must be left with new comment for example if 4 entry points then 4 comments must be left In addition you must leave email in comment or have it accessible on blog. The blog a bookworms diary hosting giveaway for bottle of natural cleaner Would it not be great if one thing we did not have to worry about was the cleaners we use to clean up the dirt we worry about? The blog she scribes is hosting giveaway for magic senses butterfly soap where 2 winners will win a really cute butterfly soap. The not so blog is hosting giveaway for a knotty bag where the winner will receive a great sophisticated looking bag. The blog feisty,frugal and fabulous hosting giveaway for punkybunks a cool place to go shopping several items that I had never seen. The blog my moms view hosting giveaway for baby jewles mother braclet there will be several lucky winners for this. The blog Go Graham Go hosting giveaway for first juice where you could win some great tasting juice. The blog the shopping mama is hosting giveaway for five blessed bows where someone is going to win some really pretty hair bows. The blog simply stacie is hosting giveaway sponsored by the etsy shop sew sew cute pillowcase. These are really cute with great fabric choices. also a giveaway for LTD chix tee is being held at simply stacie blog. The blog mud bog is hosting a giveaway sponsored by see kai run shoes where one winner will receive a pair of shoes as the prize. The blog mommy enterprises hosting giveaway sponsored by honest kids drinks these look like great drinks. grab bag reviews for kidsafe ink. These are great tattoo like impersonations that are great for kids there is a place to put your phone number if the child gets lost. the blog 1stopmomgiveaway hosting a giveaway for sumersoles shoes. These are cute and slipon I could wear these if I could hide them from my girls. Feisty, frugal and fabulous blog is hosting giveaway for bealoo kids decor art work. These are super cute and there are many different kinds available. and also a giveaway for mini mioche whi allows you to do some window shopping as an entry. The blog something snappy hosting a giveaway for seasons feel good snacks. These not only sound great tasting but sound great for you. As the mother of children with asthma and respiratory problems I know first hand how important it is to have a humidifier. The blog my sentiment exactlee reviewed the great crane humidifiers and shared the review on their blog. The cute humidifiers are super and useful. The great people at crane humidifiers are sponsoring a contest on the blog my sentiment exactlee for a crane humidifier. 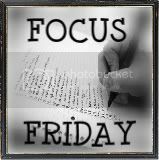 Focus friday is a meme found on the thrifty and chic mom blog and I truely thought it was a great idea so I am partaking in this event once again. straigtning the closets in our house. If you wear shorts when will you place them back into your wardrobe? at my house shorts stay in the wardrobe but are wore at night whenever the temps hit 70 degrees my teens will start to wear these outside and places they go. I will normally keep them for yard work and choose Capri's when I travel around town. Would you like to be sitting in comfort? Would you like to have your favorite chair be more comfortable? I am thinking my computer chair. Well the DKmommyspot blog has reviewed the perfect solution to create that perfect chair in the brookstone massaging seat. Go to Dk mommyspot blog read the review and then sign up for the brookstone massaging seat they are giving away. I love items that help us to remember great memories. The simply stacie blog found another great item at woodgrove which does just that. Did you have a baby born into the family, have a friend who had a baby, or will there be a baby born that you know of soon? Well, let me tell you then you should read the review on the woodgrove company over at the simply stacie blog. While visiting the simply stacie blog sign up for the personalized wooden block. Recently I reviewed the Sweet Wee Bairn Coverup. I believe breast feeding is a baby is a GOd given right and one that deserves full attention. In that effort I also believe in modesty in all that we do. The Sweet Wee Bairn coverup allows us to controll both elements giving us modesty while allowing us to breast feed our sweet wee babies. Please read my original review here. The sweet wee bairn company would love to give one of Annie's Home readers a coverup of their own with a matching diaper clutch. This would make for a darling present for your self or for someone who has or is expecting a baby. Each piece that sweet wee bairn creates has just a bit of her love inside as she creates by hand such lovely pieces. Buy: Sweet Wee Bairn creates and sells diaper clutches, coverups, diaper bags, pacifier clips, and burp cloths to just name a few of the great products she sells. You can visit Sweet Wee Bairn by clicking here and purchasing from her site. Win: Sweet Wee Bairn wants to allow one of Annie's Home readers the chance to win a coverup and a matching diaper clutch. have fun! This giveaway is for U.S. and Canada readers. Contest will run from February 26 to March 21. Winner will be notified by email so please list email if I cant find you you cant win. Winner will have 3 days (72 hours) to reply if no reply another winner will be selected. Does your baby need shoes, well does your toddler need shoes, well what about your preschooler? See kai run shoes has great shoes for all three of these categories and you can read a review on these great shoes on the Two of a kind working on a full house blog. While on the two of a kind working on a full house blog reading the great review stop and enter the great contest where the winner will receive a great pair of see kai run shoes. I am new to this blogging but I am catching on fast. I am also new to organics it seems. I thought organics only had to do with gardening and now to find out it has so many different lines to go down. Barefoot mommy found a great company that organically makes childrens clothing. French baby organics has so many items to select from and the great thing is they are all organic. You should read the review on the barefoot mommy blog and then enter to win a great outfit from the french baby organics website. The thankful Thursday meme is a great weekly meme where we can place into words our thoughts about what we are thankful for. This past September I found out that the shop my husband and I shared would have to be shut down. I was so worried about him that I forgot about myself. Somehow while worried about everyone else I slipped into depression and lost hope in many things. The only constant was my Lord was always going to be there and from him I would gain my help. Well through these last few months I did find myself depending more on him but somehow while not fully knowing it started to close into a shell. Yes we got through Christmas, I think because the Lord was there and my mind was not full of doubt and gloom. Well, recently I visited the doctor and he is a great friend of mine and suggested that I am a bit depressed. I reckon I am, was and did not want to be anymore. He said he could place me on meds but if I wanted to try other ideas first he would wait. I decided to exercise, proper diet and to change my sleep habits. Guess what all has worked better and now as they say I can see through the rain. I want to list a few things I am thankful for. As always I am thankful that the Lord was by my side and without him could of been totally lost. I am thankful that my church home all though I totally turned my back on them loved me enough to welcome me back. I am thankful that the friends that I neglected never gave up and are still as close as they always were. I am thankful for the blessing of a granddaughter that helped me to stay sane even as I slipped away. I am thankful for my husband, children, brothers and sisters who helped me when it is me who often help them. Thank you for all you bloggers out there who i have made friends with. When worrying about others I reckon we do neglect our selves but then blogging was an outlet for me and you all were there for me. Thank you. for me thankful Thursday visit the blog Grace alone. Thrifty Thursday seems to pass down to everyday of the week at times and we learn to make new items all the time so that we can save money. One of the best tips that I have this week happens because even my mom can not believe my luck. When buying meat be sure to check over all the product available. Twice while grocery shopping I have been able to find hamburger (1) for .98 a lb and (2) $1.05 a lb. I have also been able to find meat in one section at a better price than the same cut of meat in another section. This is great and has taught me to look through the meat section thoroughly before selecting. 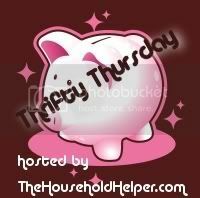 For more thrifty thursday visit the household helpers. Once again I have been introduced to some cool looking baby items. The mombuzz blog is great about finding sponsors that offer great products and they have did it again. Mombuzz reviewed bibzees and has a new post review up on their blog. The bibzees is so great that Mombuzz is able to host a giveaway sponsored by bibzees for a bibzees set. My girls grew up loving dolls. That is all but the youngest who grew up surrounded by boys and could never get in on the doll thing. The blog Peanut Butter and Pickles reviewed a great doll company called only hearts club. The dolls located at the only hearts club are great and I would have loved to shared these with my girls when they were younger. Now that my girls are grown I have a granddaughter to share things such as dolls with. Have a young girl you want to share a doll with? Read the great review on the blog Peanut Butter and Pickles and enter the giveaway while there where you have the chance to win a great doll from the only hearts club collection. There are some great giveaways going on at The Not So Blog. 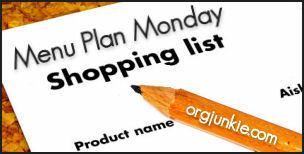 All of which carry great items you should check it out and enter the giveaways. Have you ever visited the mountains? I love them and would love to go back to them one day. The blog bargain briana brought back many fine memories when she wrote a post on Asheville. Please read this post on bargain briana blog and enter the giveaway briana has going on. Teens are just like kids and they do not always do what they know is good for them. So in order to try to ensure they take care of themselves I try to place food in the house that is good for them The blog mudpies and maryjanes recently reviewed a new drink company called honest kid. Read the review and enter the giveaway to win some honest kid drink for yourself on the blog mudpies and maryjanes. 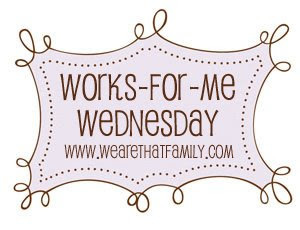 word filled wednesday is a weekly meme that allows bloggers to share their thoughts through great words and clip art. The blog 160 acre woods host this meme and you can see more there. When preparing jello make sure that the hot water it calls for is boiling and mix as suggested on the box. Before pouring into mold or casserole which I use spray with a thin layer of cooking spray. Now that may be easy but let me tell you it took me a while to figure it out. I am missing this little girl alot this week. As her momma had to choose to buy food or to pay the phone bill I will not be able to talk to her this week. Many people are finding theirselves in the same boat as my daughter. Although her husband has a great job they have been cut back at the factory to only working 2 weeks out of the 4 until economic woes get better. Lets hope that our president and congress work fast as many are suffering. God Bless. There are days that I read the blogs and they really really surprise me. Today would be one of those such days with the giveaway on the Living life one day at a time blog surprising me. It not only surprises me it excites me, such a great gift and one that could be truly useful. Living Life One Day At A time is offering a giveaway sponsored by Epson for an epson stylus printer. I love this giveaway primarily because it is what I need after losing my scanner I would love to have another one to recreate memories of times that many of the young generation do not remember. So if you would love a chance to win an epson stylus printer head over to the Living Life One Day at a Time Blog and read the great review and sign up for the contest. I recently had the opportunity to review Little Miss Clips and fell in love with them. My granddaughter who will be 6 months old sports these clips with great style. Little Miss Clips has surely helped to build katelynns wardrobe of great looking outfits. With some many great varieties of Little Miss Clips available I do believe that both her mother and I have found a great place to buy clips for each upcoming occasion in this small child's life. Please read my original review of Little Miss Clips. At this time I would love to share with you some great points that I love about Little Miss Clips. The Little Miss Clips are the most put together sturdy clips that I had found. With no worry of the clip coming apart I felt reassured that we had found a great clip. Further examination of the Little Miss Clip story helped us to see why they are so great. The creator of these great clips created the clips out of necessity. Perhaps that is why they are so great because a mothers love went into each of these darling clips. The Kirklands of Little Miss Clip would love to pass along a little bit of love to an Annie's Home reader. One of you lucky readers have the chance of winning two (2) great Little Miss Clips. Open to U.S. and Canadians readers. Must comment each entry. For example if an entry is for 2 entries comment 2 times. Contest will run from February 25 to March 18 9:00 p.m winner will be selected at that time and will be sent an email The winner will have 3 days (72 hours to respond). Email must be accessible. If no response from winner within the 3 days then an another winner will be drawn. Contest is now closed winner has been selected and has been emailed. A short while back i was able to try these great Khaya cookies. Please read my original review of Khaya cookies here. Let me remind you about the Khaya Cookies. These cookies are the best for ya cookies I have ever ate. They are not only good for the body but for the world. With the economy that we find ourselves in jobs are becoming scarce and Khaya is trying to help that problem out by committing to creating jobs with the more cookies sold. The fonder of Khaya cookies would love to give two of my Annie Home Readers a taste of their own. Khaya will send two (2) readers two (2) boxes of Khaya cookies each. 1. visit the Khaya website and tell me what two cookies would be your favorite. Remember to comment with each entry or it will not count. Contest is open to everyone. Contest will run from February 25 through March 11. Winner will be sent an email (be sure to leave email or have it available on your blog) at which time winner will then have 3 days (72 hours) to send me their information or another winner will be selected. The Island Review blog is hosting a giveaway for beauty supplies from Fairheaven Health, AmnioGenesis, & 888Ageless. 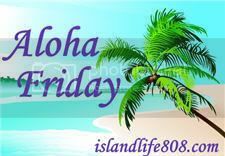 Island Review reviewed each of the site and you can read the reviews of Fairheaven Health, AmnioGenesis, & 888Ageless. by visiting the Island Review blog. There is a book called This is the day the Lord has made. Do you not just love that? I can remember singing this song over and over and sometimes when not having a great day I still do. Momstart reviewed this great boook and you can read the review here. Momstart wanted you to have a chance to win and is hosting a giveaway for the book THis is the Day the Lord has Made. If you have visited my blog at all and many of you have you have heard me speak of my granddaughter. By the way her momma did not have the money to pay for the phone bill and buy food this week so I had her go shopping and loose the phone so for this week I will not be able to talk to her. I miss her but back to what I was telling you. My daughter uses a carrier to keep my granddaughter close to her. The blog two of a kind working on a full house found a great new carrier called the ergo baby carrier. This ergo carrier is very impressive and you can read the review and enter a giveaway where you could win your own on the two of a kind working on a full house blog. A few days ago I wrote a review on a story time felts. Karen, from fun felt, would love to give my readers a chance to receive some fun felts of their own. One Annie's Home reader will receive a $25 gift certificate to shop on at fun felts. Story time felts are in my opinion the best suppliers for felt boards and visual aids. The colors of the felt pieces looked great and seemed to pop and draw the viewer in. Children are drawn in by the illustrations on the fun felt pieces that story time felt produces.Both the felt boards and play pieces that story time felts produce are great in color and style. Story Time Felts helps to promote imagination skills by allowing the child to play with the fun felt pieces while the teacher or parent tells the story. Story Time Felts have a large variety of sets which help to illustrate educational lessons, fairy tales, folk lore stories and biblical moments. In addition to the felt sets Story Time Felts products include dress up dolls, felt activity books, finger plays, puppets and CDs which help preschoolers to develop skills related to many aspect they will need later in life. Story Time Felts help to give the preschool child a jump start in education race. Story time felts help by introducing such concepts as imagination, hand play, motor skill as well as speech and language skills all of which are much needed. Each kit that Story time felts sell contains instructions that the parent or teacher can use to incorporate into a structured lesson plan. Please read my full review of Story Time Felts here. You must leave a separate comment for each entry: for example if it is for 4 entries you must leave 4 comments. You must answer the mandatory question. Contest will run from February 24 to March 10. Winner will be selected on February 10, emailed and posted on this blog. Winner has 3 days to respond to email or another winner will be chosen. I love great little toys that are available for our children today and when that toy is easy to clean up that makes it all the better. The blog Go Grahams Go introduced her readers to the pull back auto toy from best for babies in a review that she wrote for her blog. I visited the website best for babies and knew instantly where Felicia from Go Graham Go was coming from. Now best for babies are sponsoring a giveaway for a pulls back auto ont the Go Graham GO blog. I love jewelry. My grandmother and mother always had great jewelry collections and guess who was always borrowing. Me thats right and now that I have my own my girls are always borrowing from me. The giveaway introduced me to a great new jewelry called beadaful designs. I really do love what the beadaful design people have to offer and you can read the review and enter a giveaway contest on the giveaway blog. This little girl behind the large cake is my niece Autumn. I love her very much and since she just celebrated her first birthday I thought I would share a bit about her many talents. Autumn Faith Stewart: Daughter of my dear brother and his wife (one of my best friends). Talents: attracting the whole rooms attention, being cuter than cute can be and beating up her brothers LOL. Latest talents: pulling up to standing position and walking with assistance. Past talents: holding bottle, crawling, making everyone chuckle and being a terrific baby sister, daughter, granddaughter and niece. Autumn Faith Stewart I will always love you. Happy Birthday to you and may the rest of your life be as special as your first year was. You have a large family that loves you and a mommy, daddy and 2 brothers who will always take care of you. Not to speak of the Grandmas, Aunts, Uncles, Cousins, and special friends that will make sure you are just fine. We recently had a very tiny baby born into the family. You see the mother of this young girl is only 14 years and she is a bit lost. Her mother walked out on her family and know she finds herself with a tiny sick baby. I would love to help her out and will as her aunt in any way that I can. I recently read a review on the living life one day at a time blog about a baby safe monitor that sounds like it could truely do the job. Please keep this young lady in your prayers and visit the living life one day at a time blog to read the review and enter the giveaway for a baby safe monitor. I love the idea of a blanket just for daddy. One thing that I admire my son in love for was because he takes care of my little gal in the middle of the night. In order to allow my daughter a break and some much needed sleep he will stay up at night with my granddaughter. The blog feisty, frugal and fabulous reviewed the daddy blanket and you can read it here. It is such a great invention that I entered the contest on the feisty, frugal and fabulous blog sponsored by the dogre company where the winner will recieve a daddy blanket. I love to play games with the kids. In fact that is what we do nearly everyday at our house. The blog From Melissas desk introduced me to some great games that I had never seen. You can read the review on the Melissas Desk and then enter the giveaway for two of the great out of the box games. I would love to share about a giveaway and congratulate a fellow blogger. The Janana bee blog is celebrating their 200th post and guess what one lucky winner will recieve a gift. To find out what is being given away visit the Janana bee blog and enter the giveaway. Do you just hate it when you bra pops out when least expecting? I do I hate to wear dresses and worry if that bra strap will be seen if I raise my hand. I wear allot of sleeveless dresses in the spring and summer and worry about raising my hand or shaking hands. I normally wear a jacket but would love to not have to and now that I read a review on the blog therapeutic reviews I may not have to. Therapeutic reviews reviewed a great product called peekaboob. Peekaboob is also sponsoring a giveaway on the therapeutic reviews blog. Does your little one love blankets? I can remember when our little one was little I had blankets on top of blankets. My granddaughter has many blankets of her own but when I saw this Go Blanket I knew that I had to have it for her. When I received the blanket I was in love. It was so soft and cuddly but it was different from other blankets as well. My daughter who travels allot with her little one always complained about not having anywhere to lay her daughter to change her. I think the Go Blanket will make this experience much better. The Go Blanket is meant just for traveling around. One of the reasons that the Go Blanket is different than other blankets is because of the polarfleece it is made of. Polarfleece is ready to take on that abuse that young children can deal out. Punching, pulling, kicking and dragging will all be withstood by the polarfleece. In addition to being able to withstand abuse polarfleece is also the most breathable warmth that you can find in a blanket. For those times that are a bit cool the Go Blanket can be used to snuggle your little one in. Do you have those blankets that have been spilled on and worn and now do not smell the best? This wont be the case with the Go Blanket. Polarfleece doesn't retain water, break down in appearance, itch, or pick up odors. 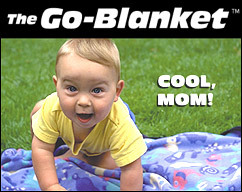 The Go Blanket is as dependable as your little one will become on it. The toddler Go Blanket arrived to me in a mailable envelope and I had no idea by the weight that there was a blanket inside of it. The Go Blanket is not a heavy blanket which makes it even more appealing for me. Our Go Blanket was in the pattern of the animal crackers and as you can see the colors and animal shapes were great. There are many colors and patterns available for the Go Blanket. Perhaps you do not have a little one and you think this product is not for you. Then I have to say to you what about taking a Go Blanket on a picnic to a picturesque scene like this. So the next time you are looking to take a blanket on the go think of the Go Blanket. I love the idea of taking your cotton bag shopping with you. I love all the little bags and they are so much better than the plastic bags that we had hanging around the house. Envirosax has some of the cutest bags I have ever seen . The envirosax has recently been reviewed by the frugal mommy of 2 girls blogs. The envirosax website is worth a look at just to see the cool bags but if you read the review on the frugal mommy of 2 girls blog you have a chance of winning a great bag of your own. we will be using leftovers and meals left out for breakfast and lunches this week. New set up next week and for more monday menu visit here. While window shopping on the internet I came upon a wonderful site called elegant cheesecakes. First I must tell you all that my son in love is a first rate fan of cheesecake. Having it both at his wedding reception and wedding. It was as special as the wedding cake itself. The pictures on this website itself are great and start your mouth to wattering. OH! what it would be like to take just a small bite of that cheesecake. Not only do they make cheesecakes but wedding cakes and birthday cakes as well. Can you imagine the happiness of that special reciever of a great cake like this. My hopes is that one day I will be able to taste an elegant cheesecake for myself. As the price of these cheesecakes do not fall under the category of need since we lost our business all I can do is window shop. Window shopping is so much fun if you are needing a special cake for a special event or person check out the elegant cheesecake website. If you are just wanting to window shop as I do then no better place than the elegant cheesecake website. Is it not great when we know we are doing the right thing for our children? Is it not great when we know that there is none better for our child? Zoe B Organics would list right up there for the great items they carry that are all natural and thus are great for our children. The blog sage and savvy recently reviewed the teethers at Zoe B Organics and shared the review here. If you are interested in getting one of these great teethers for your little one then enter the giveaway contest on the sage and savvy blog where one winner will recieve a zoe b organics teether. The first time I was introduced to childrens books that were christian by genre was in a college class were future students were introducing books for future students. The author was Max Lucado. The zanderkids have books that will truely shape your children into adults that you want them to be. The blog 5 vines monkeys reviewed the zanderkids books and are offering a giveaway where the winner will recieve 2 books. Little feet desire little shoes and see kay run shoes fit those little feet. Blonds, Poop, Mascara blog recently reviewed the see kay run shoes. If you would like to get a pair of the see kay run shoes for your little ones enter the giveaway contest on the blonds, poop, mascara blog. Mama Makes Money hosting giveaway sponsored by layers clothing. The layers clothing company offering a $25 gc for you to go shopping. I always love to shop on someone elses money. 1. It was not me who beat my husband at cards over the weekend. It was not me who gloated about the fact. It is not me who normally loses because of not paying attention to the game. Since it is not me who is concentrating more on the kids and what they are saying and doing. 2. It was not me who went to church yesterday and found out that I love it. It is not this same church that I left because my teens were not happy. It was not me who looked for another church home to only go back to the church that we left and found home. 3. It was not me who helped cook supper in that same church kitchen for the youth group. It was not me who was seriously so happy to be there when I saw how excited my teens were. I truely have to say I came back home to where I belong. 4. It was not me who was sick to my stomach that I missed my nieces birthday. I would never try to avoid a great family get together where I did not know if an argument would ensue, no not me. It is not me who thinks that my family argues too much and that I find myself in the middle too much, no not me. That is my top 4 not mes of this week. Please visit my charming kids website for more not me fun. Do you struggle to find new and fascinating ways to teach your child? Let me tell you that there are some great ways that will create lasting memories and dittydoodle is one of these. The blog riding with no hands reviewed the dittydoodle cd set and you can read that review here. If you think you may want to get a set of these cds for yourself you can try to win them in the giveaway sponsored by diddydoodle on the blog riding with no hands. I recently received 3 little miss clips and let me tell you they are darling. Little miss cips are so small and cute but hold so much style. My granddaughter is sure to sport these Little Miss Clips well. I inspected the Little Miss clips and they are well put together and style well. I have to say that little miss clips are some of the best put together clips that I have personally ever seen. Because our family is into butterfly's for one reason or another at the present time we chose the butterfly little miss clip as one to be sent to us. I was a bit worried at first that the butterfly would come off and would get in the babies mouth. Well let me tell you, that butterfly is so snugly and tight on there that there is no possible way that that it will come off of this clip with normal use. That was another selling point for me. Yeah!!!!!! Little Miss Clip had passed the test again. Since we think our little granddaughter Katelynn is a princess of course we had to have a Little Miss clip with a crown. But the next thought was would it stay in her hair. I can tell you that katelynn's mama was born with a full head of hair but by 6 months had lost it all. Katelynn had been born with a full head of hair and had kept it but now approaching 6 months old she was starting to shed a bit so her hair was a bit fine and I was worried about the clip staying in her hair. I read the little miss clip story and found out that the reason they were developed was because the creators daughter struggled to keep clips and barrettes in her own hair. Thus the little miss clip was developed as a need had developed. Buy: Little Miss Clip is available in a wide arrange of colors and themes. Little Miss Clips are $4 a piece. A piece of mind when you know you are buying them and they will stay in your daughters hair. Many times we spend money and ten minutes later that product is no longer of use. What a great value Little Miss Clips are at $4 each and can be wore numerous times. Great!! So if buying a little gal a gift that you want to be sure she can use think of Little Miss Clips.